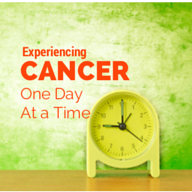 As a cancer patient or the family of a cancer patient, you hear “one day at a time” A LOT, and you learn pretty quickly the phrase has a deeper meaning. When starting treatment, one day at a time means you know what you are going to do that day, and the next day will be a whole new day, with all new appointments and expectations. I found this out the hard way. The first three weeks after Mom’s arrival to our home quickly became a blur – with one day morphing into another with attention given to little else. This was when her diagnosis was being studied, reviewed at Tumor Board and her treatment plans developed. It is a hectic time – I assume this is no different than what other cancer patients experience. During the second week, she was scheduled to have the small lesion in her brain radiated. As we were being told what to expect for that treatment, we talked specifically about Monday and Tuesday. Nothing was said about the rest of the week, other than that the tumor board was meeting on Tuesday morning. Assuming that we’d get a bit more notice than a day, I jumped on the opportunity to schedule a couple of conference calls and RSVP’d for a board meeting on Wednesday. Tuesday arrived. The treatment went well and then we met with the radiation oncologist. He shared the outcome of the Tumor Board and then said he’d want us back the next day to start the preparations for the radiation treatment of the lung tumor. The next day was Wednesday – the day I had packed full of appointments and the board meeting. Hmm…. I had the rest of the day to figure out how I would manage the busy morning I had planned, get my daughter to school and get Mom to her appointments at 8 a.m. Ultimately everything worked out fine. My husband dropped our daughter off at a neighbor’s house for a ride to school; I took Mom to the hospital, getting her situated in Radiation Oncology, before coming home to do the conference calls and attend the board meeting. Then I returned to the hospital to pick her up. Unfortunately, she did end up waiting almost an hour for me to pick her up. Chemotherapy is also a “one day at a time.” For Mom, her chemo day is the same day she sees both physicians in addition to her radiation treatment. It is a full day made even more complicated by the “wait and see” of the lab results. Before each chemo treatment, blood must be drawn to determine whether Mom is even able to have chemotherapy that particular day. While it is easy to plan a full day, it is difficult to gage what time the day will end. The first couple of chemo days were challenging. Since I work from home, I needed to make arrangements for my daughter after school. She would need a ride as well as be able to stay with that neighbor until either my husband or I got home. I hate to ask my neighbors to watch my daughter without knowing how long she needs to stay. After the second chemo day of uncertainty, we asked about the possibility of having labs drawn on Tuesday. Wednesdays got a bit better once we got this worked out, but they were still VERY long and tiring days. Little things, attention to details, can make a good experience an even better experience. Mom has been very happy with how her care has been managed; so have I. My professional perspective notices these opportunities – and with me being the caregiver, my sensitivity is heightened regarding making my experience more positive. Educate: During the initial stages of treatments, I wish the physicians and nurses would have looked further ahead than just one day or one treatment schedule, and think about the caregiver who is attending all of the appointments with the patient. Engage: Engaging the patient and their caregiver in the process – whether it is in determining the scheduling of appointments, understanding the future treatment needs, or just asking how things are going – furthers their feeling of empowerment. Empower: In this case, knowledge is power. Understanding the process, the timeline and the needs versus necessities versus wants as it relates to the treatment will lead to more conversation and questions, which can only lead to a better patient experience throughout the entire relationship.